When you’re in a band, there is no substitute for chemistry. You can be the best musician on the planet, but if you can’t connect with the other members of your group, you won’t be climbing the ladder of success any time soon. Luckily, this isn’t a problem that plagues Brighton’s cosmic instrumentalists Toska. Despite Toska only debuting in February 2016 with their Ode To The Author EP, the power trio of guitarist Rabea Massaad, bassist Dave Hollingworth and drummer Ben Minal have been playing together in a plethora of different bands for over a decade. Fear not, ChasinJade’s metal is a far cry from the experimental, cinematic heaviness that Massaad and co now specialise in. 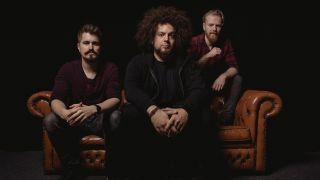 After the band’s 2012 split, its three instrumentalists stuck together, refining their repertoire by playing for bands Toseland, Dorje and, ultimately, Toska. Interestingly, despite the trio’s technical prowess, Toska is their first-ever purely instrumental outing. Unlike some other instrumental acts, Toska prove on their first full-length release, Fire By The Silos, that there’s more to them than just swanky shredding and showing off. The 70-minute concept album balances Massaad, Hollingworth and Minal’s obvious talents with the heaviness of pounding grooves and the ambience of spoken-word interludes. When all of these elements combine on tracks like Prayermonger, the result is a dark, atmospheric journey befitting of the album’s dystopian storyline. On Fire By The Silos, Toska challenge with ethical quandaries that accompany their hard-hitting metal. With the complexity of its music and its concept, it goes without saying that the album is a triumphant leap forward for these progressive comrades.